You must make reservations at least 5 minutes in advance of the time at Maison Blanche. A deposit of $50 per person for party of 7 and above. *On Mondays Chef Jose Martinez offers personalized grocery shopping and cooking classes in Your Homes. So please make a reservation for either or both!! The culinary experience will surely make you a regular. Maison Blanche provides free and ample self parking for all our diners. Praised by foodies and visitors as Sarasota’s best, the chef had a Michelin Star for his Paris restaurant, made semifinalists James Beard Foundation for Best Chef (South) in 2010, a Longboat Key leading Zagat food rating of 27 and #1 " French cuisine" in the area with 96% of positive survey . The room is designed by award winning architect, Franck Hammoutene, a striking contemporary white minimalism accented by gray leather seating. The wine list has an award of excellence and the dining room and staff is overseen by wife Victoria who, with impeccable grace and care, attends to every detail, matching her husband’s passion for perfection. Maison Blanche offers progressive French cuisine, a savory balance of classical French cookery with modern American influences. Your Maison Blanche occasion is brought to life in a sophisticated menu featuring “Farm & Field to Table” local ingredients as available. Your Maison Blanche dinner, a truly memorable experience. Great quality food - which can be challenging to find in FL sometimes...but not in Longboat Key! The food and atmosphere at Mason Blanche was amazing. I ordered the fresh fish special and it was delicious. We also ordered the chocolate soufflé for dessert. I would highly recommend this restaurant and it was the perfect place to celebrate our anniversary. Maison Blanche never disappoints. The food is wonderful and exquisitely presented and the service is incomparable. My favorite restaurant on Longboat Key. Thank you - I will keep coming! Service not as attentive as we would have expected for fine dining. Water glasses sat empty and we had to ask to have them refilled. What a hidden gem! We've lived in Sarasota for 20 years and can't believe we've missed Maison Blanche! The food was amazing and ambiance was lovely, especially for our wedding anniversary. It is pricey but on par with any other higher end restaurant in town. We thoroughly enjoyed our meal, the evening, the wine selection and will most definitely return. Bravo staff and Chef, Bravo! Best fish (Mediterranean Sea Bass) dish I can recall. Anywhere. 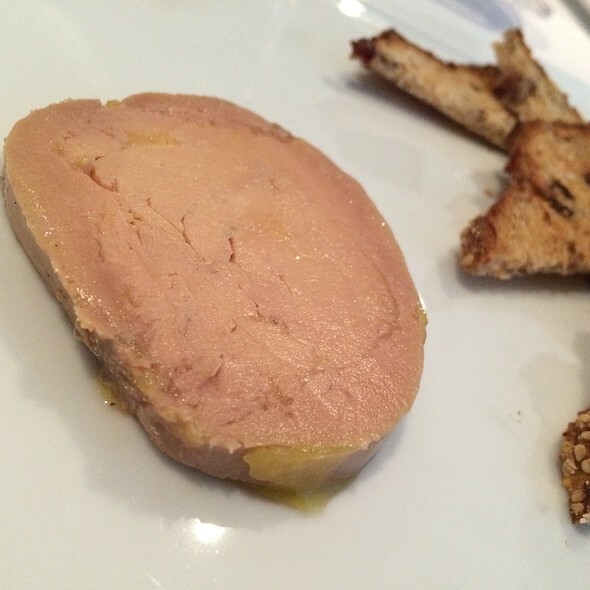 We have eaten at Bouchon (Napa), Bernardin and Boulud (NYC), Bocuse (in Lyon) and a dozen other high-end French restaurants. 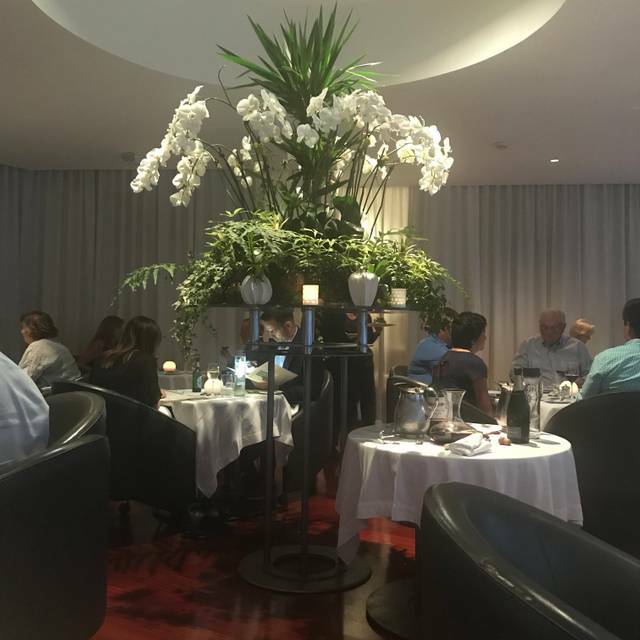 While Maison Blanche may not have the breadth of a high-end big city French restaurant, it has depth, and the food quality and service are excellent for a small city. My husband and I had a reservation for earlier (5:45 p.m.). While the restaurant is in a hotel/resort on Long Boat Key, the decor is refined serenity. Victoria, one of the owners (the chef is the other), was friendly and professional. Her accent gave away her Parisian history. A French couple owning and running a French restaurant? AWESOME!! We ordered a nice, reasonably-priced Pomerol to enjoy with dinner. Michel delivered some excellent mini baguettes to start. I pride myself on my execution of crispy, rich baguettes; these were on a par, but beautifully right-sized. tuna tartare (with zucchini); it was fresh and very tasty. 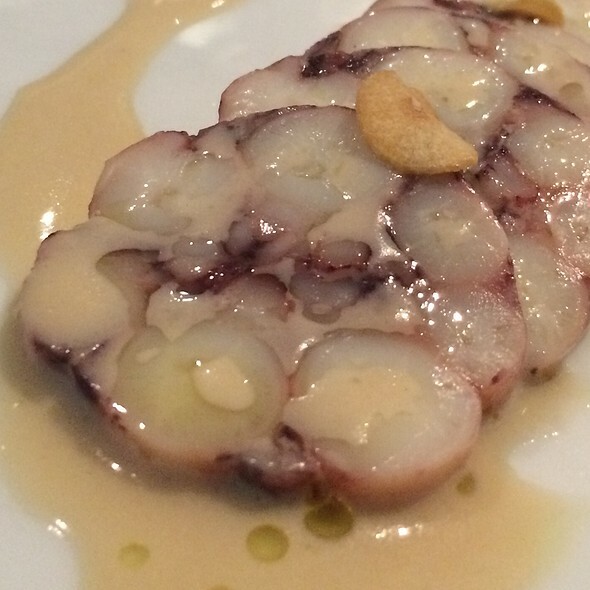 We had ordered the grilled/roasted octopus as an appetizer. They split the plate and presented it with a sweet pepper and onion relish that was delicious. My husband had the short rib with puréed potatoes. He LOVED it. I had the prime rib eye, medium, with vegetables. My rib eye was done in a cast iron pan, resulting in the perfect crust (NOT burned, but seared just right). My accompanying vegetables were fresh and crisp. The desserts (chocolate soufflé and vacharin) were a perfect ending to a great meal. Thank you, Maison Blanche! We’ll be back! This is the best restaurant in Sarasota. Great French cooking and French service. Beautiful, elegant, quiet dining room made conversation easy. We enjoyed selecting a lovely French white from the extensive selection of wines. Our salads and entrees were delicious and well presented. The service was attentive without being intrusive. It was really relaxing, much appreciated evening! Still the best French food in Sarasota area, with nice changes periodically. Worth the trip! Maison Blanche is truly one of the most outstanding restaurants along the Tampa Bay/Sarasota coast. I initially was a patron of their original location in Paris for many years and was delighted to find them again in Long Boat Key. The extraordinary quality of the French modern cuisine and wines, the fine service and refined, contemporary decor make for an exceptional evening for any resident or visitor to the area. 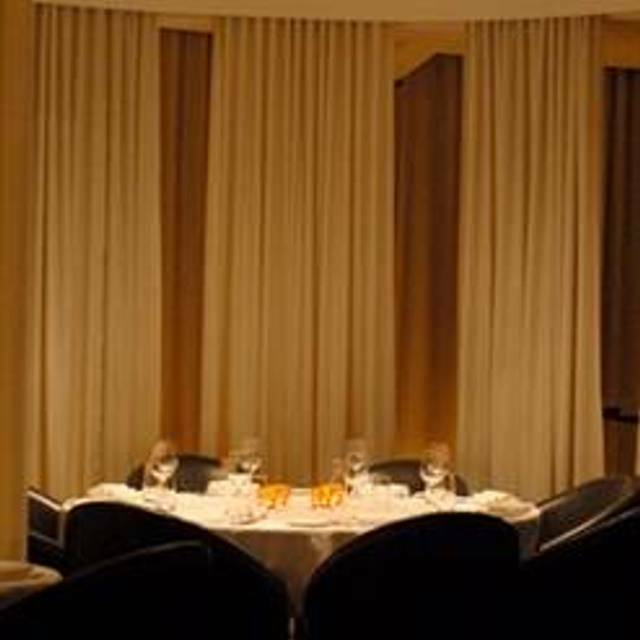 Exceptional food experience with service to match, the restaurant has a feeling of intimacy without pretense. While the setup is formal, you don't need to dress up to fit in. They referred to attire as casual chic and that was accurate. There isn't a bar, so getting a table is important. Don't go for a sunset view, there's nothing to see and the windows are curtained which helps keep the noise down. They have an extensive wine list, mostly French, and our server was able to help us with an appropriate selection based on our tastes. This may be one of the best meals my husband and I have ever had. From beginning to end our experience, food and wine pairings were amazing! Can’t wait to return. Superb from the moment we walked through the door until we finished our after-dinner Sauternes. The quality, flavors and presentation of the meal was outstanding. The service was professional and impeccable, the ambience understated elegance. So looking forward to our next visit. shockingly good. by far the best food and experience in the sarasota area and probably SW florida. modern french served with style. not much more expensive than other sarasota and island choices but way better. 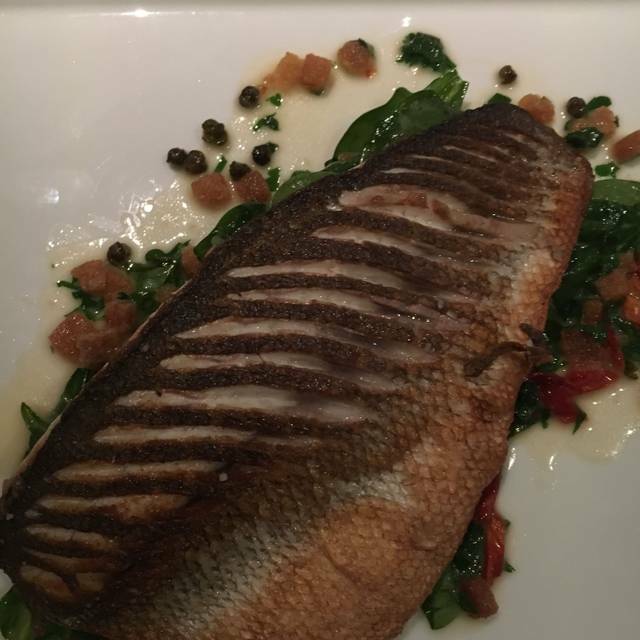 my sea bass entree was equal to top notch paris or new york. intimate quiet dining room. a very very special place. We have been to Maison Blanche many times, and it never disappoints. This is the best restaurant in the Sarasota area. 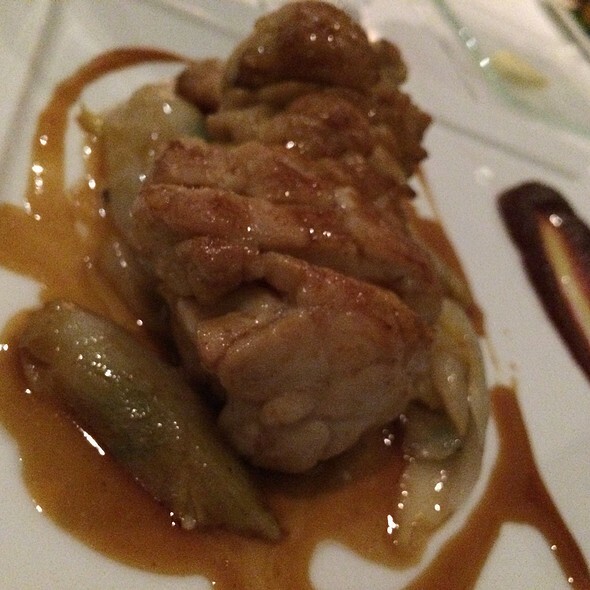 Chef Jose's excellent combinations of flavors are a treat for the palate. Service is uniformly excellent and the ambiance is lovely. It is rather expensive and/but remains an excellent value. 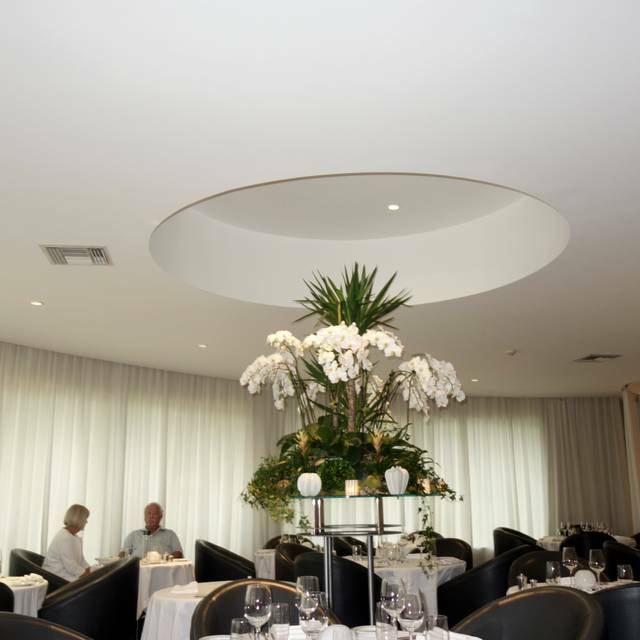 We recommend Maison Blanche without reservation. The wine list,particularly the white and red burgundy,is unique to this area and there are many rare gems. Lovely food and excellent service in a beautiful peaceful atmosphere. Delicious in every bite! Beautiful setting! Excellent staff! Interesting dining experience. Old school French . Lobster ravioli was the hit of the dinner! Dining chairs are a bit odd, menus looked like they were glued in place by a kindergarten class. Wine list was very nice and varied. Waiters French accent came and went. Red Snapper and Salmon were both very good, pig was meh. Overall good evening. We love dining at Maison Blanche. My husband loves the chanterelle risotto and the beef filet with peppercorn sauce. I love exploring the menu. I recommend exploring the menu, every dish is delicious, try a different each time. Be sure to save room for dessert. The wine list is also very nice, something for everyone. The staff are terrific, attentive and very knowledge. We brought our daughter with us this time. She had never been to Maison Blanche. She told us the sea bass was the best fish she's ever eaten. As always, the food, service and atmosphere was impeccable. An amazing restaurant! Best restaurant in Sarasota area! 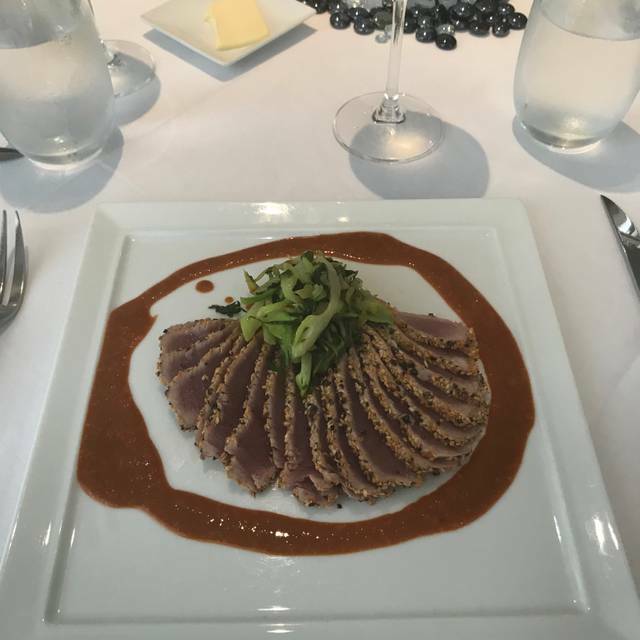 Having moved to Sarasota from the Washington DC area a few years ago, we have sampled all of the top restaurants in Sarasota. Maison Blanche is one of the 2 best. The cuisine is French cooking at its best with creativity and perfect preparation. The management and staff are outstanding and the room has an understated elegance. Value and price compare favorably with the best restaurants in DC. It is always the right choice for a special occasion. I brought as my guest a wonderful person, a Holocaust surviver. 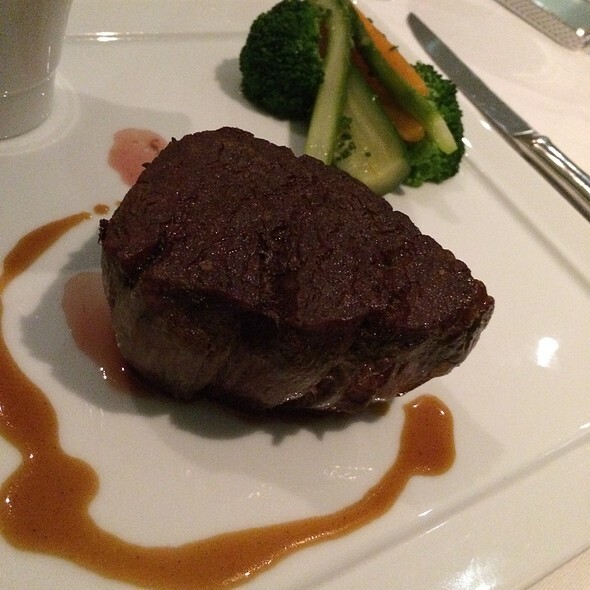 Unfortunately the filet mignon he requested was not raw but well done. This was our 3rd visit to Madison Blanche. The service, ambiance, and food are consistently superior. My niece and I loved our dinner! Victoria is amazing and helped us greatly with the menu and suggestions! Thank you, Victoria! This is a very good restaurant. The food is lovely. So are the surroundings & ambiance. Full French service!! The curtains are a clever way to sound damper. Be prepared for some sticker shock. As advertised this is a $$ restaurant. Our dinner was very enjoyable. The ambience was excellent, the food was very good, and the service was polite, if a little slow. We loved the cuisine, the ambience, our server, and our hostess. We will return again (this was our fourth visit over the last five years).